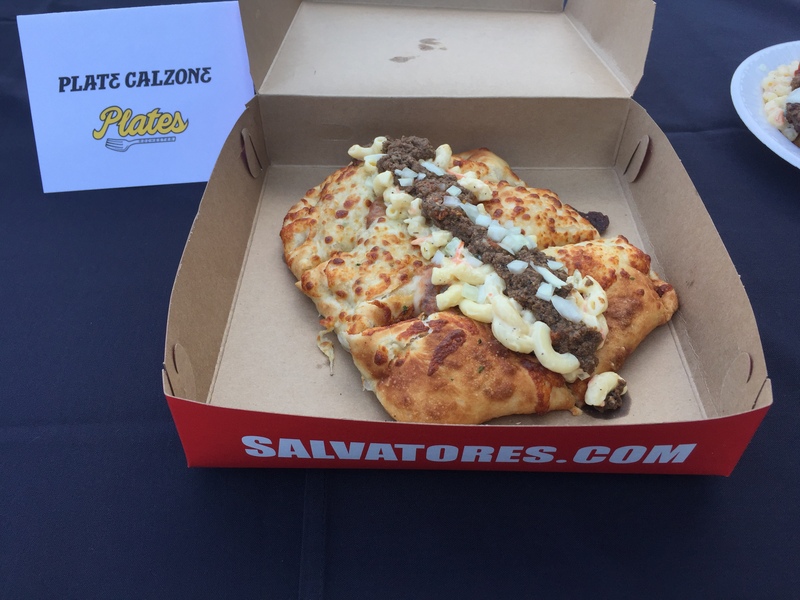 The Plate Calzone from Salvatore’s is one of the Rochester-themed variations of the Garbage Plate to be offered at Frontier Field on August 10th. Plate fever has hit Frontier Field — and the nation. 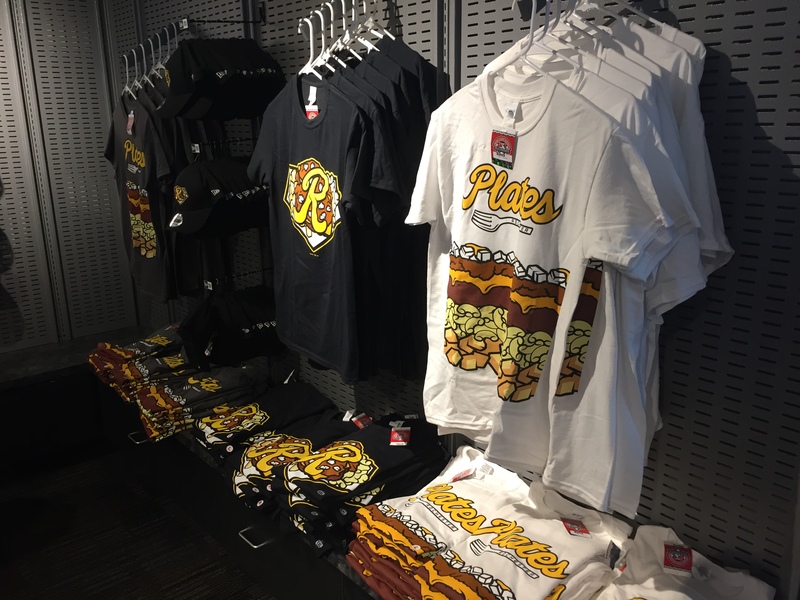 As baseball’s 100th anniversary celebration of the Garbage Plate draws near, the limited-edition merchandise remains a hot-seller for the Rochester Red Wings, who for one night will call themselves the Plates. The team is filling online orders as fast as merchandise supplies arrive in advance of the Aug. 10 promotion. “No matter what your title is at the Red Wings, you’re a team store employee right now,” general manager Dan Mason said. The Buffalo Chicken Plate features chicken cheesesteak atop fries and macaroni salad, plus hot sauce, blue cheese and diced onions. While staffers pack the Plates jerseys, caps and/or T-shirts into the Priority Mail boxes, Jeff Dodge, general manager of food and beverage, has gone on a creative binge with his concessionaires. 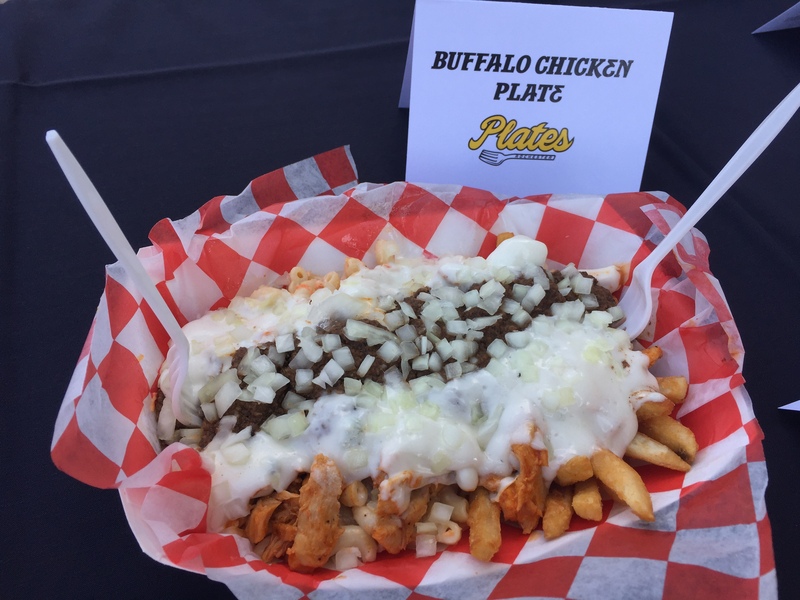 Not only will Alex Tahou and his staff from Nick Tahou’s be at Frontier Field making and serving the original Garbage Plate, Dodge’s food stands will offer their own culinary concoctions meant to imitate the iconic plate. Such as the Buffalo Chicken Plate, which features chicken cheesesteak atop fries and macaroni salad, plus hot sauce, blue cheese and diced onions. Or the Osier Plate, featuring a split baked potato piled with Red Osier beef and then smothered with cheese sauce, hot sauce and diced onions. Or the Plate Calzone from Salvatore’s, where home fries and pepperoni are wrapped in pizza dough and then covered in meat hot sauce. When the Wings came home on Tuesday to start a critical three-game series with the Lehigh Valley Iron Pigs, the team store was once again fully stocked with Plates caps and shirts. The hot-selling merchandise hadn’t been in the store since July 5 due to the overwhelming demand from online orders. The team was shipping it out as fast as it arrived. Promotional nights featuring the regional food items have become the in thing for minor league baseball teams. The Fresno Grizzlies started the trend by honoring the taco. Since then there has been one-night wonders such as the Syracuse Salt Potatoes and the Lehigh Valley Cheesesteaks. The New Orleans Zephyrs went one step farther, well actually 365 steps farther and permanently changed their name to the Baby Cakes, a play off of the king cakes of Mardi Gras. Mason, however, believes the Wings’ promotion is truly unique because the Garbage Plate, invented by Nick Tahou a century ago, is native to Rochester. And it’s all because of the original Nick Tahou’s restaurant, which is now operated by Nick’s grandson, Alex. “He’s getting the acknowledgment for what his family deserves,” Dodge said.